Age-hardening in Al alloys has been used for over a century to improve its mechanical properties. However, the lack of direct observation limits our understanding of the dynamic nature of the evolution of nanoprecipitates during age-hardening. 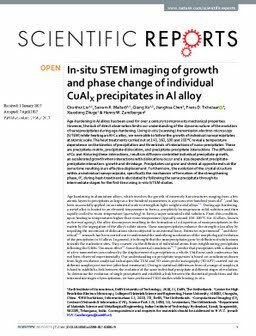 Using in-situ (scanning) transmission electron microscopy (S/TEM) while heating an Al-Cu alloy, we were able to follow the growth of individual nanoprecipitates at atomic scale. The heat treatments carried out at 140, 160, 180 and 200 °C reveal a temperature dependence on the kinetics of precipitation and three kinds of interactions of nano-precipitates. These are precipitate-matrix, precipitate-dislocation, and precipitate-precipitate interactions. The diffusion of Cu and Al during these interactions, results in diffusion-controlled individual precipitate growth, an accelerated growth when interactions with dislocations occur and a size dependent precipitate-precipitate interaction: growth and shrinkage. Precipitates can grow and shrink at opposite ends at the same time resulting in an effective displacement. Furthermore, the evolution of the crystal structure within an individual nanoprecipiate, specifically the mechanism of formation of the strengthening phase, θ′, during heat-treatment is elucidated by following the same precipitate through its intermediate stages for the first time using in-situ S/TEM studies.